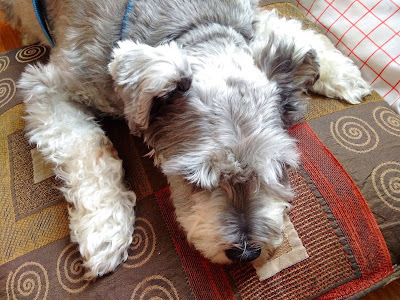 ‎I can't ever tell whether our dog, Frasier, is napping or awake on account of his massive schnauzer eyebrows. But given how relaxed he looks on his pillows here, I'm not entirely sure it even makes a difference. Looks like a great place to be, doesn't it? It sure does! I like to think that dogs dream all day and night long, awake or not! Their life is just that dreamy! It's their twitching when asleep that entertains me. Our schnauzer Max snores so despite his big eyebrows, we know when he is sleeping and dreaming! Our dog Max, snores his head off when he is really fast asleep! But a mere whiff of food and he is awake, ears up, sitting hopefully. He is the greediest dog I know, always after food. Anyone would think we never feed him!